The thought of a fibromyalgia exercise program when you have fibromyalgia or other chronic conditions may conjure up images of pain, fear and frustration. Here’s the good news! When your physician suggests that you exercise to help improve your fibromyalgia, you don’t need to feel discouraged. Exercise for fibromyalgia doesn’t have to mean thirty hard and fast minutes on a treadmill. Instead, visualize feelings of peace and relaxation, along with the strength and balance you will build as you do slow, precise stretching and strengthening on your mat or the Pilates equipment. Fibromyalgia is an arthritis-related syndrome characterized by widespread muscle pain and tenderness. Look here for more information about joint pain and exercise. If you have fibromyalgia, you may also experience migraine headaches, poor sleep, anxiety and a host of other troublesome symptoms. While there are men who suffer from fibromyalgia, most of the estimated 10 million people in the United States with this condition are women. Research has repeatedly shown that regular exercise for fibromyalgia is one of the most effective treatments. Without exercise, fibromyalgia can indeed seem to be a progressive disorder, as unused muscles stiffen and atrophy, causing more pain and muscle damage. Following a fibromyalgia exercise program with an emphasis on Pilates can stop this progression and keep you from becoming deconditioned. Pilates will help you build muscle strength and reduce overall muscle tension. Beginner Pilates exercises help alleviate widespread chronic pain from any cause by focusing on gentle strengthening and low impact movement, while avoiding any jarring movements that can cause injury. With Pilates you will practice flowing movements, gentle strengthening and a gradual progression. When you begin your fibromyalgia exercise program, you may have to work through some additional discomfort at first as your body becomes used to more movement, but within weeks Pilates will start to alleviate your symptoms. I have many clients with fibromyalgia symptoms and what seems to work best for them is a 20-30 minute Pilates routine involving low repetitions and working the exercises through a moderate range. 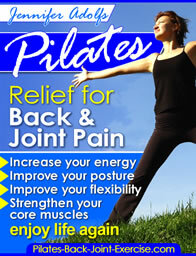 Get your own Beginner Pilates DVD for Healthy Back and Joints here. A common symptom of fibromyalgia is fatigue. Sometimes exercise for fibromyalgia seems like too much effort. Though on some days the combination of pain and fatigue may make even walking out to your mailbox feel like an exhausting task, it's crucial to stay as physically active as possible. Pilates exercises helps to increase your overall energy levels, so you feel less tired. You will find the quality of your sleep begin to improve. It is during deep, "restorative" sleep that your body produces the hormones required to repair muscle tissues. Pilates also improves your mental health, helping to reduce the anxiety, sadness, and stress that you may experience coping with fibromyalgia. Learning to perform the Pilates exercises will increase your sense of accomplishment, which helps if you sometimes don’t feel in control of your life or your mood. You’ll also reduce levels of the stress hormone cortisol while you boost those feel-good endorphins. Find out more about Pilates and how it can help with your fibromyalgia exercise program here.